Anyone who has ever held a pre-1965 Fender Precision Bass will know what we mean. Sometimes you haven’t even got to plug it in; you just know you are in the presence of something special. Many would say the best bass guitar ever made. It arrived in our world in 1951 and since has had a bumpy ride in terms of quality. At first brilliant, then not so good, sometimes made so poorly it made you weep, it has now recovered, but still, those pre-65s. 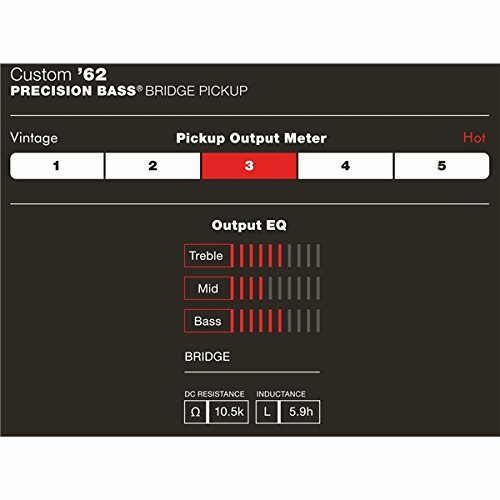 However, if you want to change the pickup on your Precision? There are some good options. Time To Get Some Vintage 62 Precision Or Just Be A Bit Different? Decision Made, What To Buy? If you own a Precision bass that is not a 1962 model, maybe it’s a copy or a Japanese version, then here is your chance to acquire that sound. It is no exaggeration to say that the Precision with its unique sound shaped not one, but many musical theatres. From early blues through the embryonic rock and roll period, to Motown and finally to the heavy rockers, driving it, all on somewhere was usually a Precision often with these pickups. This split coil pickup gives you all the options and all the sounds. The balances across the frequencies are just right, giving you the sounds and they are dynamic and highly responsive. It has a full, rich sound but when you begin to drive it when you hear what it is capable of. Thundering depth, as much top as you dare apply, they give you that vintage Precision sound, so mellow at times, so angry at others. Fender has utilized the best of the new technologies, Alnico 5 flush fitting magnets and magnet wire with an enamel coating to make this a superior product, while also retaining its vintage feel and making the sound a faithful reproduction. The upgrade is a fairly simple process, but depending on where your Precision was manufactured you might need to make some small adjustments as you fit. Never mind, it will be worth it. If you have bought a Precision at some time from wherever at the time they were being made, you have bought a decent guitar. These pickups will turn it into the real deal and at a very realistic price. To summarize – they produce the sound of a 62 Precision, why would you want anything else? An authentic recreation of an iconic sound. Doesn’t include any new tonal options. DiMarzio of course, make quality pickups and there Precision bass model is a well-made product. They have attempted to stick to the Precision sound formula as closely as they can, and they have made a good job of it. 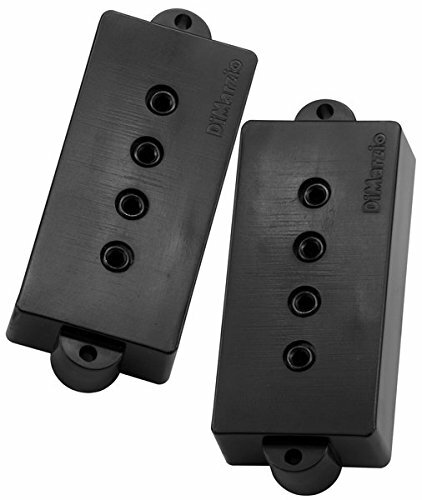 They have designed a two-piece hum reducing pickup that has a big sound and plenty of punch. It has all the mellow tones we know that can be achieved with a Precision, but they have also been able to accent the mids to create an aggressive attack rock sound. It does quite a bit more than that though, making a significant increase in the volume of the guitar. It is therefore not that difficult to really begin to drive it. In many respects, DiMarzio has enhanced the sound that you get in some Precision bass varieties somewhat. Those mellow ‘Motown’ sounds are now richer and warmer, and they seem to have made the top end more pronounced without sacrificing anything at the low end. As a pickup, it is versatile and handles most styles of music comfortably. It is a quality pickup, but if you are looking for that original vintage sound, then this isn’t quite it. They have stayed close to the Fender formula, but it is not going to be a like for like switch. It’s not designed to be. Some players though may want to get just a bit more from there pickup, and it will certainly do that. It is bright and clear but still resonates at the bottom end. 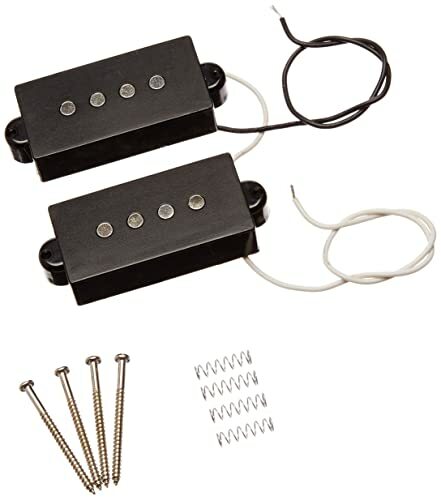 A lot of players will appreciate this pickup for the sound it delivers which is powerful and strong. May not suit those looking for a more vintage sound. Seymour Duncan has deviated away from reproducing the vintage Precision sound and instead have created an alternative. 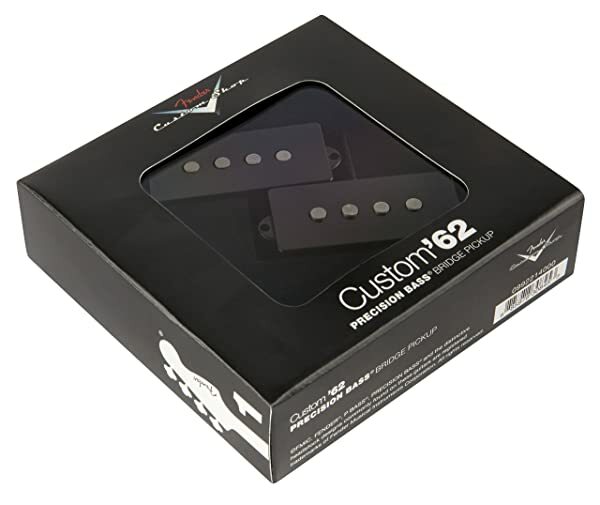 This pickup has received design changes that have produced a big, full sound with plenty of mid sounds and a significant increase in volume. Ideally suited for the heavier rock sounds, it drives very hard while still maintaining its clarity. It does though offer a lot of variety in sounds that make it an attractive proposition for a player wanting a change. It has a softer side with a warm, mellow feel which will transfer into something else at the turn of the tone control. 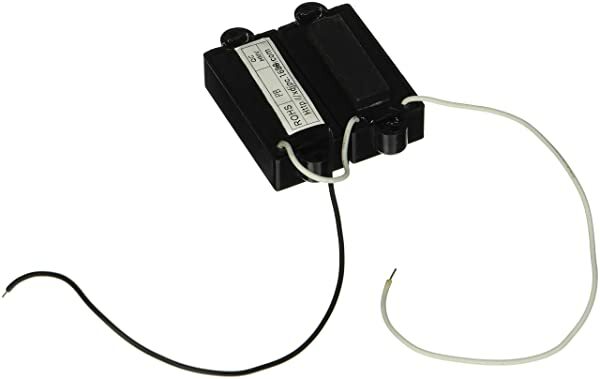 This pickup is very sensitive and will create a lot of sustain. It is an easy replacement and will drop straight into any American made Precision, but you may need to ensure they will fit into those made in other countries. It may be wrong to make comparisons, but in comparing this pickup to an original Fender, this has far more top end and attack and therefore is more aggressive. It has tonal options but is designed to be this way and therefore will lose some of the great sounds that made the original Precision’s so good. It is a pickup made for change and hasn’t set out to replicate the original. It has tried to add something more, and those players looking for something different will appreciate it. 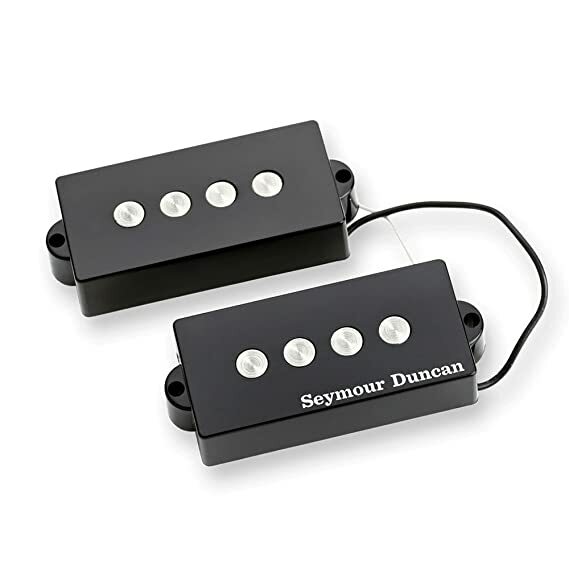 Seymour Duncan is nothing if they are not creative and they always try and push the boundaries. They have done that with this pickup which is powerful and has a lot going for it. Stays close to the Fender traditions but adds something extra. Delivers a big punchy sound. 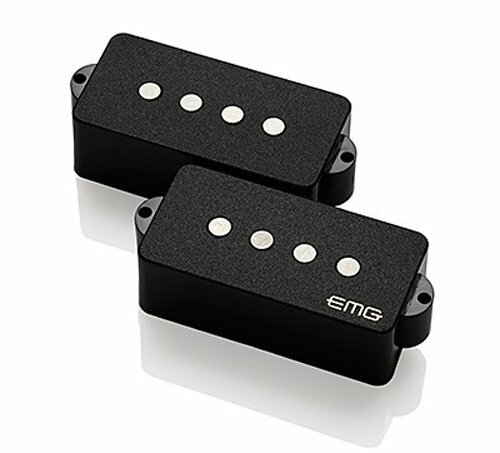 EMG has teamed up with Black Sabbath’s bass guitarist Geezer Butler, to produce this signature Precision bass pickup. Very much trying to recreate his individual sound from what most consider their best days in the ’70s, it has a very sharp and tight bottom end, mirroring the sound on so many tracks we’ve heard. It is a single coil pickup but has had the background hum removed leaving just that thundering sound. The sounds it creates lend themselves to blues and hard rock and leaves little room for too much in the way of finesse or mellow tones. It has Alnico magnets which help to deliver a semblance of the vintage sound and is fully shielded. No battery is required for the passive pickup. So, what can you expect from this pickup? Well, it’s remarkable how close they have come to reproducing Mr. Butler’s sound. The bottom end is in the driving seat but with a very sharp edge. It fairly thunders along as you would expect. You could argue that there isn’t much of the original vintage feel about it, but then he was using a vintage guitar but with some serious settings driving it along. You can have most of those settings built right into the pickup. If that sound is your thing, then you are going to have fun with this. Set at a reasonable price. A bit of Fender, a lot of Geezer, quite a pickup. Loud, powerful and very heavy rock. Recreates a particular highly charged sound. Moving away from the traditional vintage Precision sound. Sooner or later someone was going to put a humbucker on a Precision. This isn’t the first time of course, but let’s see how it measures up. The first thing to say about them is that you are not going to get much of a vintage 62 sound with this. If that’s what you want, then these will not suit. What you are going to get is what a humbucker gives you and today, what it is designed to do, and that creates a whole load of noise. This one is going to wake up the neighbors. It will assault your ears with aggressive output levels, and the levels of distortion will give you incredible sustain. It is powerful. It does have its quieter moments, however, and if you can control it, this pickup is capable of producing some nice warm tones. That though, is not what it is about, and if you are remotely considering pushing the boat out in your thoughts about a replacement pickup, you might want to have a listen. Humbucker on a Precision? Your choice. The purists are running in all directions, and they have a point. Why would you not want a Fender sound on a Precision bass? We understand that but here is a change for those that do. Maybe you could attach them to a cheaper precision copy and watch that burst into flames. It might. A fantastically powerful pickup, it’s just whether it sits right on a Precision. Only you can decide that one. It does have a price tag that says just give it a go and see. Very aggressive sound with little of the vintage about it. This is a difficult question to answer. The Fender Precision bass, the 62, is possibly the greatest bass ever manufactured. All pre-65 were outstanding instruments, but do you want to sound similar? We say similar because it will not be exactly the same, but some pickups will get very close. Changing the pickups is going to alter the sound of your bass, sometimes drastically. This will have a knock-on effect with the people you may be working with, so changing pickups is a huge decision. What is it about your guitar you don’t like if anything? Are you thinking of changing pickups when it is really another reason? Changing pickups will not change the shape or the weight of your guitar, won’t help it stay in tune and won’t turn you into a ‘rock god’ overnight. Maybe you have a cheap Fender copy and want it to sound better or maybe a Precision built in the times and geographic locations when the company was struggling at the time. All good reasons to upgrade to a better pickup. Fender did have a reputation for a while of using ‘real’ Precision bodies in manufacturing but then fitting them with inferior cheap electrics and hardware. If you have a Fender and it just doesn’t sound good, that may be the reason, and it is time to change. Maybe you just want to sound ‘different’ but don’t want to add another guitar to the collection. Changing pickups on a guitar is sometimes more of a sound change than changing amps. All of the pickups we have reviewed offer something and as sound generators are all excellent. If you want to sound ‘62’ then there are items on the list that fit the bill. Some of them have tried to stay as close to the tried and trusted vintage sound as possible. Others have gone to extremes with big tonal changes and even a humbucker. Maybe you like your Precision but just want it to do more sound-wise, which if you have a guitar that is a bit lacking in the tonal department, the big changes to the sound will give you. One of the things we were impressed with in reviewing these pickups is that all had their own unique sound options. Some were very subtle, others not subtle at all, but they all give the player options. There is nothing wrong with wanting something new and different. It would be a very dull world without variety. Some bass guitarists love their Precision and wouldn’t change it for anything, but there’s nothing wrong with trying out a different sound from it. It’ll still feel like a Precision, the neck, the weight, the body is all still there, but the sound will be different. Will that impact on your music and how you play it. Only you can decide. The options are there in the reviews, have fun choosing. It is never easy choosing from products we have reviewed. There is something good and positive in everything, but when confronted with a choice about pickups, the sound of your guitar, it becomes a little tricky. We though will be traditional. In our opinion, the 62 Fender Precision is the best bass ever made and to have the option of that sound, or as near as you can get to it, then that is enough. We have therefore decided that the best Precision bass pickup is made by the people who should know. Great sound, great price, does a wonderful job.